The process of recycling a vehicle is extremely complicated as there are many parts to be recycled and many hazardous materials to remove. Briefly, the process begins with incoming vehicles being inventoried for parts. The wheels and tires, battery and catalytic converter are removed. Fluids, such as engine coolant, oil, transmission fluid, air conditioning refrigerant, and gasoline, are drained and removed. Certain high value parts such as electronic modules, alternators, starter motors, infotainment systems - even complete engines or transmissions - may be removed if they are still serviceable and can be profitably sold on; either in "as-is" used condition or to a remanufacturer for restoration. This process of removing higher value parts from the lower value vehicle body shell has traditionally been done by hand. A labour intensive process, that has meant it is uneconomical to remove many of the parts. A technique that is on the rise is the mechanical removal of these higher value parts via machine based vehicle recycling systems (VRS). An excavator or materials handler equipped with a special attachment allows these materials to be removed quickly and efficiently. Increasing the amount of material that is recycled and increasing the value the vehicle dismantler receives from an end-of-life vehicle (ELV). Other hazardous materials such as mercury, and sodium azide (the propellant used in air bags) may also be removed. After all of the parts and products inside are removed, the remaining shell of the vehicle is sometimes subject to further processing, which includes removal of the air conditioner evaporator and heater core, and wiring harnesses. The remaining shell is then crushed flat, or cubed, to facilitate economical transportation in bulk to an industrial shredder or hammer mill, where the vehicles are further reduced to fist-sized chunks of metal. Glass, plastic and rubber are removed from the mix, and the metal is sold by multiple tons to steel mills for recycling. ^ "Vehicle Recycling". 16 September 2008. Archived from the original on 16 February 2013. Retrieved 21 May 2012. ^ a b c d e f "Benefits of Recycling Car Bodies". Archived from the original on 17 February 2014. Retrieved 21 May 2012. ^ a b "You Auto Recycle - A Guide for Vehicle Recycling". Retrieved 21 May 2012. 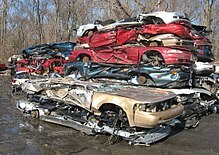 Wikimedia Commons has media related to Automobile scrap yards. This page was last edited on 4 September 2018, at 12:36 (UTC).